I think my body is trying to kill me, the benign tumors growing in my pelvis are causing more and more nerve pain with each passing day. More than half my life has been spent suffering from it and I’m meeting with a neurologist next week to see whether or not I will need a third surgical procedure. Red heads are more susceptible to pain than any other hair type and more resistant to anesthesia, so not only is this already severe pain intensified by the melanin in my hair and my fair skin, but I also get to look forward to waking up during my surgeries while I’m split open. It feels good to talk about it. 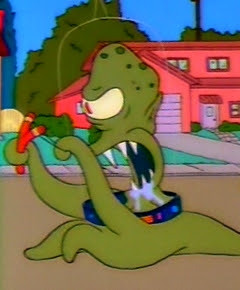 The kindergarten massacre and the ensuing debate on gun laws makes me think of The Simpsons “Tree House of Horror” where Lisa wishes upon a cursed monkey paw for world peace, only to have Kang and Kodos enslave humanity with a slingshot and a club. Earth was then saved from alien enslavement by Moe Sislack chasing them off planet with a two-by-four with a nail in it, at which point Kang & Kodos prophesied one day the human race will create a board with a nail in it so big, it will doom mankind”. The evolution of American serial killer culture over the last half century has been quite interesting. It now seems impossible in this modern age of technology to pull off the killing sprees like Ted Bundy did back in the day, he never used a gun, had a kill count over 30, and evaded the police for years. Psychopaths are part of the human condition, the ways that the lash out will continue to evolve in terrifying ways, and whatever causes that evil cannot be stifled or prevented no matter what weapon laws or mental care policies we put into effect. Can anyone really imagine a world where evil doesn’t exist? Is it possible to uninvent the firearm? We are powerless in these regards. On a Lighter note Lane Willheims Dungeon Mastered a truly remarkable D&D session last night, My Paladin, named Fraxel, who rides into battle atop a massive battle rhinoceros, named Axel, slew the evil doers and lust demons and attempted to lift the dark cloud the lingered over us all after the shooting. It was a magical evening.